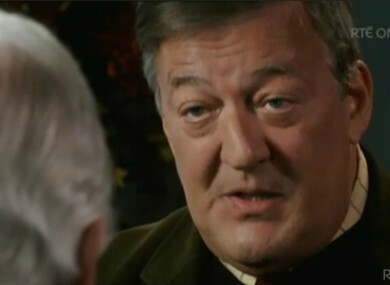 LAST NIGHT WE finally saw Gay Byrne’s full interview with Stephen Fry as part of The Meaning of Life series on RTÉ One. Last week a preview clip of the interview had gone viral, and this had only build anticipation for the in-depth chat that aired on Sunday. Right at the start, Gay got right down to Fry’s past life of compulsive stealing that plagued his younger days. “At what stage did you come into this compulsive thieving?” Gay started with. Fry followed this up with a tale of credit card fraud that left Gay in shock. When Fry met Hugh Laurie at Cambridge, they had an instant connection. “From the very first moment you met, you were spirits at one,” says Gay. So Stephen Fry, Hugh Laurie AND Emma Thompson were all at Cambridge together. Imagine being in that group! Also, those two hanging out with Emma Thompson would have made quite the college group of friends. “If there is anything I hate, it’s a party.” Fry’s tales of cocaine use and self-medicating gave everyone an insight into his early years. “I believe I am.” Fry starts out, going on to give details of his medication to control his bi-polar disorder. ”Bi-polar is a chronic condition like asthma or diabetes – you have to manage it,” he says. Garnering over three million views before the full interview had even aired last night, the portion of the interview where Gay asks Fry about his views on whether there is a God and what he would think about that God if it were to exist caused much online murmuring. And that’s the note that the interview finished up on. #StephenFry was a joy on #TheMeaningofLife. Could listen to him talk all night. #GayByrne's reaction to the God question was priceless. Email “The 7 best moments from Gaybo's interview with Stephen Fry last night”. Feedback on “The 7 best moments from Gaybo's interview with Stephen Fry last night”.